“May God keep them all safe and put an end to these fires!” the archbishop said in a message sent via social media channels and posted on the archdiocesan news site, AngelusNews.com. News reports said that flames prompted evacuation orders for nearly 200,000 people, destroyed nearly 200 homes and remained mostly out control as of early Dec. 6. To date, officials had reported no fatalities. On Twitter, Los Angeles Auxiliary Bishop Robert Barron said the fires in Ventura County, which is in his pastoral region, had alone forced 30,000 people to evacuate. Known as the Thomas Fire, it erupted northwest of downtown Los Angeles. “Join me in praying for all the evacuees, firefighters, officials, and everyone helping to subdue the flames,” he tweeted. About 1,000 firefighters were working to contain the wind-driven flames. Among the evacuees in Ventura County were students and faculty at Thomas Aquinas College in Santa Paula. 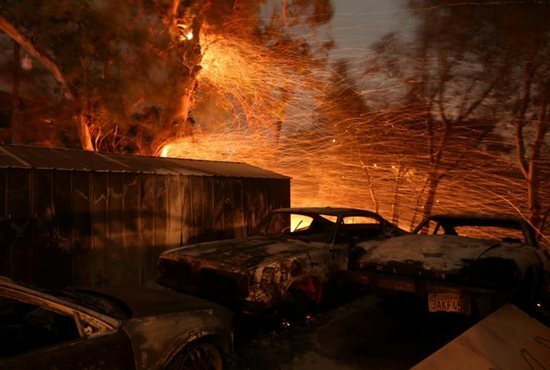 The fire destroyed 50,500 acres as it nearly reached the Pacific Ocean the night of Dec. 5. It had started a day earlier about 30 miles inland, according to news reports. Students from California who had transportation were considering returning home for the time being; others planned to remain at the homes of local friends and faculty. The college added: “Please continue to pray for the safety of all those affected by the Thomas Fire as well as for all firefighters and other first responders. St. Thomas Aquinas, pray for us!